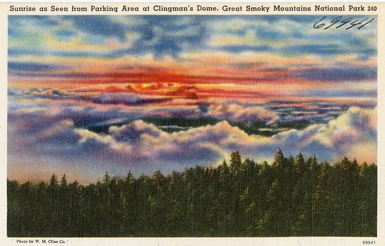 A postcard shows the sunrise in the Smoky Mountains. The windows in my apartment face southeast. This doesn’t matter except that we’ve started keeping the blinds open in the kitchen. While I make coffee, I’ve begun noticing the sun’s rising—fiery fields degrading into sky. On the mornings when I wake up earlier, I just see the slim line of blue shining under night. It’s later that I see dawn’s climax, not through the window but in the hallway and on the walls. They glow from light streaking in. The description of Sinai in this week’s passage seems similar. Smoke enfolds the mountain and is driven upward by the divine fire at the center. Meanwhile the whole mountain shakes, and a trumpet crescendos in perpetuity. What happens at Sinai exceeds the appearance of the sun, which can be explained by the earth’s rotation and atmospheric refraction. At the same time, they both affirm the fullness of creation that emerges whenever the natural world demands attention. The technical term for what happens at Sinai is “theophany,” meaning that God has appeared. And around this revelation, Exodus explores the relationship to other parts of religious life—words and rites to be specific. Before God appears, God recounts Israel’s history and Israel affirms these words (vv. 3-8). And then God outlines rites of consecration, abstinence, separation, and preparation (vv. 12-15). Then after the description of God’s appearance, readers remain at Sinai attending to legal codes for the rest of Exodus, Leviticus, and part of Numbers. This tension between what can be explained and what can only be witnessed underlies this lesson. It is a question that arises too in Dylan Thomas’s poem “Fern Hill.” Amid the pastoral scene, Thomas imagines “the whinnying green stable.” The provocative language shows an inanimate building participating in near speech. The scene is magical, almost like Sinai or burning walls. It is an important way of encountering the world, but at the same time, a stranded traveller might also want to know that it isn’t the stable that whinnies, but horses inside. So it is that our relationship between describing encounters with God and understanding them might shape the way we experience moments of transcendence. • In what natural events have you encountered the divine? • What kinds of language help you to cultivate appreciation for the majesty of creation—poetic language or logical language? • What practices can help you to appreciate different ways of seeing? How might these observances help you to experience God? Verses 3-15 recount the preparations for theophany (“God’s self-manifestation”) and for Israel’s encounter with YHWH. Once more at the mountain, YHWH “calls to” Moses (v. 3bα; cf. 3:4). Once more, YHWH commissions Moses as prophet par excellence to Israel (vv. 3bβ-6; cf. 3:15-22). The commissioning of Moses follows the standard pattern of a messenger’s speech (3:7-10). The two phases in the process of delivering the message are clearly marked:..
YHWH refers to the people by two titles. The first, much rarer, “the house of Jacob,” recalls their modest beginnings as a tiny family of seventy people when they first arrived in Egypt (cf. 1:5) and addresses them as a collective group. The second, by far the commoner, “the children of Israel [NRSV: “Israelites” somewhat under-represents the formal parallelism in the Hebrew],” using the name of promise that God gave to Jacob (Gen 32:29; 35:10), recalls how in Egypt they became a people, “numerous and powerful” (1:9), and addresses them as an intergenerational succession. This pair of terse phrases recalls the miracle of Israel’s survival and growth and affirms the latent promise about to come to splendid fruition. The message itself is in two parts: (1) the review of past action, the momentous events that have brought Israel to this time and place (v. 4); and (2) the promise of Israel’s future status, the unsurpassable possibilities to which these past events are the prelude (vv. 5-6). The first phrase of v. 5, “Now therefore,” drawing the consequences from the past for the future, provides the hinge between the two parts. William Johnstone, Exodus 1–19, Smyth & Helwys Bible Commentary (Macon GA: Smyth & Helwys, 2014), 397–98. Scholars disagree on how broadly to define theophany. One definition is J. Kenneth Kuntz’s “a momentary manifestation of the deity during which he communicates to man something of his nature, name, and purpose” (The People of Ancient Israel, 67). Such an appearance may be in order for God to speak (Exod 19) or to deliver (Judg 5:4-5, 19-21). The God-initiated revelation is one of sovereign power; in response to it, nature is disturbed and humanity becomes awestruck. The revelation is to a mediating individual, and the site of the experience frequently becomes a sacred place. And interesting aspect of biblical theophany is that although God is perceived in the experience, God is not actually seen; either there is overwhelming light (Exod 24:16-17) or a cloud of thick darkness (Exod 19:16-18) out of which God speaks. The visual experience of God in Exodus 24:9-11 may be an exception to this, although the story does not share most of the characteristics of a theophany (there are no convulsions of nature and the theophany is not mediated to the people). Similarly Moses’ glimpse of the back of Yahweh in Exodus 33:9-23 lacks these theophanic details in addition to being initiated by Moses rather than by God (33:18). The theophany at Sinai in Exod 19 is the most complete of the theophanic accounts in which God speaks as opposed to delivering. Carol Stuart Grizzard and Marin E. Tate, “Theophany,” Mercer Dictionary of the Bible, Watson E. Mills et al. (Macon GA: Mercer University Press, 1995), 908.